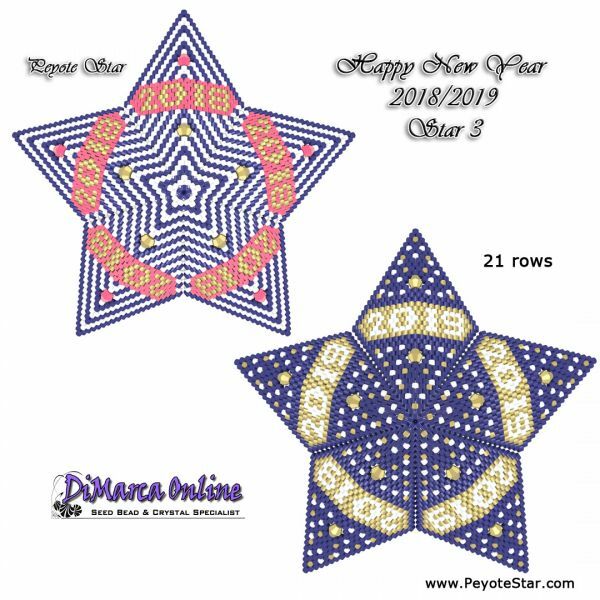 + Basic Instructions "Little 3D Peyote Star"
This beading pattern provides a colour diagram and word chart to create the HAPPY NEW YEAR 2018/2019 STAR 3 Peyote Star. This star has 2 sides: one side shows 2018 and the other side shows 2019. This star has 21 rows. 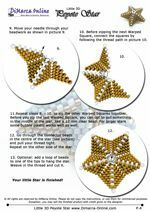 Included are also the step by step instructions with clear 3D images of how to create a 3D Star in peyote with warped squares ("Little 3D Peyote Star") and how to insert bicones. You will receive an e-mail with a download link to download the 11 pages PDF file. It includes a list of needed materials and colour codes. The star is beaded with Miyuki Delica's. You can also use Toho Treasures (but don't mix them, as there is a slight difference in size). The beads or finished product are not included, this is the digital pattern to make your own 3D Peyote Star. © All rights are reserved by DiMarca Online. Please do not copy the instructions, or use them for commercial purposes. Feel free tosell the finished product.